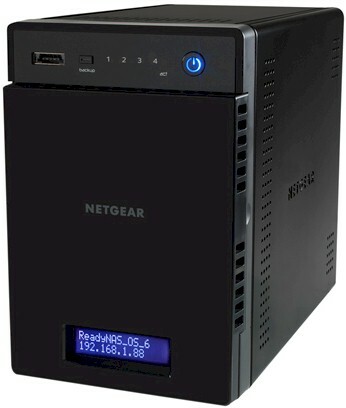 In March, NETGEAR announced its all-new ReadyNAS family, comprised of 100, 300 and 500 series models. The ReadyNAS 100 has two and four-bay versions, both powered by 1.2 GHz Marvell Armada 370 SoCs. This review covers the performance aspects of the RN104. The all-new ReadyNAS OS 6 is covered in its own review. NETGEAR didn't stray too far in the RN104's redesigned look. The sturdy metal chassis and covers were carried forward and even the rear panel carry handle is there. The change is mainly in the front panel cover, which is solid plastic instead of perforated metal. The 104 still has a front panel LCD panel that is handy for checking the unit's IP address and other information. As the callout diagram above shows, there is a decent assortment of ports including eSATA, USB 2.0, USB 3.0 and dual Gigabit Ethernet. Unlike some of the latest generation NASes, the 104 doesn't have VGA or HDMI ports for attaching a display. What is does have, however, is a tool-less drive tray, which is pretty nifty. Each tray has a label with illustrated instructions for loading in a drive. The video below also shows how it is done. You have to pretty much disassemble the entire RN104 to get to the board. But the power brick is external and so easily replaced. Fan replacement could be simpler because it is connectorized and on the removable rear panel. But to get the back panel off you need to remove both side covers, which seems an unnecessary complication. The key components are summarized in Table 1. Note that both the CPU and SATA devices have heatsinks. NETGEAR supplied an RN10400 diskless model for review. So I added our customary four Western Digital Red 3TB drives (WD30EFRX) for testing. Power consumption measured 30 W with the 4 drives spun up. I couldn't measure power consumption with the drives spun down because idle drive spindown didn't make the cut in the transition to OS 6, at least not in the initial release. Fan and drive noise were classified as very-low; I really had to strain to hear it in my quiet home office, even when under load during testing. The ReadyNAS setup process has been completely redesigned and doesn't require a CD to be run or the RAIDar utility to be installed. You just connect the ReadyNAS to your network, boot it, let it grab an IP address, then aim a web browser from a device connected to the same network at https://readycloud.netgear.com/. The initial screen from the setup wizard is shown below. Although you will be prompted to set up a ReadyNAS Remote account during setup, you don't have to do so to get set up. To skip the nagging entirely, just aim your browser at https://ipaddress. This lets you do everything you need to do to get set up without an internet connection or registering with NETGEAR. As with previous ReadyNASes, the RN104 by default is set to use NETGEAR's automatic volume expansion X-RAID technology. If you want to kick it old-school and use RAID, you'll need to switch to "Flex-RAID" mode. You still need to do this via the boot menu, which is still accessed by pressing the reset button while powering on the NAS. Unfortunately, unlike the old RAIDiator OS, OS 6 does not provide an option to format drives directly in Flex-RAID. If you want to use disks that were previously formatted for an operating system other than ReadyNAS OS 6 (for example, Windows or RAIDiator), you must reformat the disks. This was easier said than done, since I wasn't successful doing this by following the instructions in the manual. In the end, I pulled the drives from the system, threw them in a SATA drive dock attached to my Win 7 system and deleted all partitions from each drive. This at least let me start the volume build process instead of encountering an error. But this just let me build an X-RAID volume; I still had to switch over to Flex-RAID. Suffice it to say, I was not a happy camper by the time I finally had a four drive RAID 5 volume built and sync'd, a process that took almost 32 hours! RAID 10 build time was a lot faster, but still slow by comparison to other NASes at 18 hours and 30 minutes. Building a RAID 0 or RAID 1 volume took about 11 hours. NETGEAR asked me to clarify that users normally don't need to wait for a volume to be completely built / resynced / cleaned before use. As soon as the volume is created, it can be used. However, our normal testing practice is to wait until the volume creation process is completely finished before running our tests. Otherwise we would be testing performance during volume build, which would be lower.